CLINGMAN, Thomas Lanier, a Representative and a Senator from North Carolina; born in Huntsville, N.C., July 27, 1812; educated by private tutors and in the public schools in Iredell County, N.C.; graduated from the University of North Carolina at Chapel Hill in 1832; studied law; admitted to the bar in 1834 and began practice in Huntsville, N.C.; elected to the State house of commons in 1835; moved to Asheville, Buncombe County, N.C., in 1836; member, State senate 1840; elected as a Whig to the Twenty-eighth Congress (March 4, 1843-March 3, 1845); unsuccessful candidate for reelection to the Twenty-ninth Congress; elected as a Whig to the Thirtieth and to the five succeeding Congresses and served from March 4, 1847, to May 7, 1858, when he resigned to become Senator; chairman, Committee on Public Expenditures (Thirtieth Congress), Committee on Foreign Affairs (Thirty-fifth Congress); appointed as a Democrat to the United States Senate on May 6, 1858, to fill the vacancy caused by the resignation of Asa Biggs; reelected in 1861 and served from May 7, 1858, to March 28, 1861, when he withdrew; expelled from the Senate in 1861 for support of the rebellion; chairman, Committee on Revolutionary Claims (Thirty-fifth Congress); during the Civil War was a brigadier general and commanded Clingman's Brigade in the Confederate Army; explored and measured mountain peaks; died in Morganton, Burke County, N.C., on November 3, 1897; interment in Riverside Cemetery, Asheville, N.C.; Clingman's Dome was named in honor of Thomas Lanier Clingman. Clingman was an ardent lawyer, Fire-Eater, and one of the most outspoken politicians of his era. His proslavery and states' rights positions climaxed with his quote to Congress, "Do us justice and we stand with you; attempt to trample on us and we separate!" He initially commanded the 25th North Carolina Infantry Regiment and subsequently Clingman's Brigade. General Robert E. Lee's trust and esteem for Clingman were vividly reflected when Lee ordered Clingman to defend Richmond, Virginia. Later, at Lee's request, General Clingman and his "Bonnie Blue Boys" greatly assisted in routing the Union forces at the Battle of Cold Harbor, Virginia. General Ulysses S. Grant was a West Point graduate and veteran of the Mexican-American War, and he wrote of Cold Harbor, "I regret this assault more than any one I ever ordered." General Grant was elected the Eighteenth President of the United States. Clingman's principal services were witnessed in: the defense of Goldsboro; defense of Sullivan's island and Battery Wagner during the attack on Charleston; the attack on New Bern in February 1864; the defeat of Butler at Drewry's bluff, May 1864; the Battle of Cold Harbor, where he was wounded; the repulse of the Federal attack on Petersburg, June 17th, and the battle on the Weldon railroad, August 19th. In the latter fight, he was severely wounded and was unable to rejoin his command until a few days before the surrender at Greensboro. After the war, he was a delegate to the national Democratic convention of 1864. Clingman was a contemporary and dear friend with the only white Cherokee Chief, William Holland Thomas. 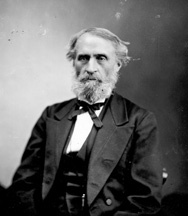 Thomas was a senator and during the Civil War commanded Thomas' Legion of Cherokee Indians and Highlanders. Bibliography: Dictionary of American Biography; Jeffrey, Thomas. ‘Thunder From the Mountains: Thomas Lanier Clingman and the End of Whig Supremacy in North Carolina.’ North Carolina Historical Review 56 (October 1979): 366-95; Kruman, Marc. ‘Thomas L. Clingman and the Whig Party: A Reconsideration.’ North Carolina Historical Review 64 (January 1987): 1-18; University of North Carolina at Chapel Hill; Official Records of the Union and Confederate Armies; National Archives and Records Administration.